Today Oaks class invited their Grandparents into our classroom! We began the session by asking some questions about their Grandparent's childhood. 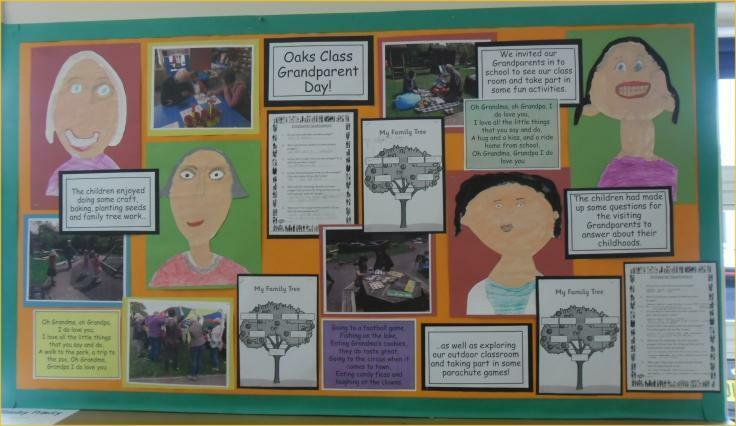 Then the children took their Grandparents around their classroom and carried out a variety of activities, from sharing a book, decorating a cookie, planting some flowers, making a family tree, maths activities, painting and exploring our outdoor classroom! The session ended with some parachute games on the field followed by an assembly. The children presented their Grandparents with a photo frame they had made in art lessons, they recited a beautiful poem and I ended with reading a lovely story called 'How to Babysit a Grandad' by Jean Reagan. The children's Grandparents were also able to look at their Grandchildren's books too. We thoroughly enjoyed our afternoon and we hope our Grandparents did too! Grandparents had a go too!